The BE Wise campaign within the Division of Student Affairs is kicking off its yearlong campaign at the second annual BE-BQ event Friday, Sept. 6, from 4:30-7:30 p.m. on the Quad. The campaign strives to generate awareness of alcohol poisoning, how to avoid it, its signs and how to respond to it. 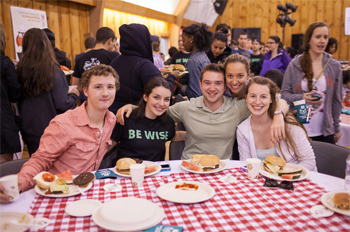 Students enjoy the first annual BE-BQ last spring at the Skybarn on South Campus. Photo by Drew Osumi. The BE-BQ is free and open to all students. There will be barbeque food, lawn activities and a volleyball match between SU Ambulance and the Department of Public Safety. Additionally, three students—Victor Suarez ’15, Avery Landau ’17 and Nathan Fornal ’16—will be participating in a DJ competition at 6 p.m. Students who attend will be able to text in votes and the final winner will receive a BE Wise trophy. The BE Wise campaign began in spring 2013 as a way to build awareness of the growing danger of alcohol poisoning on campus. Its goal is to engage students and equip them with the knowledge to make safer decisions, as opposed to telling students not to drink. Student affairs has been working with the Newhouse-based student public relations firm Hill Communications, which helped craft the campaign’s messaging, as well as develop the marketing and promotional strategies. There are three central pillars to the BE Wise campaign: BE Real and know your limits; BE There and make the call when someone is in need of help; and BE Aware by knowing the signs of alcohol poisoning. The campaign uses the acronym C.U.P.S. to remind students of the signs: cold skin, unresponsiveness, puking and slow breathing. For more information on the BE Wise campaign, visit http://www.bewise.syr.edu. Follow it on Facebook at http://www.facebook.com/BeWiseSU. For questions, to schedule a BE Wise Training or for inquiries about integrating the campaign into existing programs and curriculum, contact subewise@syr.edu.